Wigington runs the website Geoengineering Watch.org and has compiled a massive amount of data on the harm and damages geoengineering or “chemtrails” have done to the Earth. Wigington also discusses how the federal government is gagging meteorologists, right down to those in local weather networks to prevent the information about geoengineering from getting out. Propaganda has fully infiltrated academia so much so that most people have tossed logic and reason aside in favor of the official narrative, even though that narrative rarely (if ever) makes any sense. Wigington also discussed the problems he’s been having with Facebook. The social media giant is known for its censorship in favor of government propaganda, but Wigington wants everyone to know its a fact, not a theory that Facebook is restricting factual information in order to brainwash the public on behalf of the government. After the interview with Greg Hunter concluded, Dane Wigington passed along a few short videos that show what geoengineering looks like. 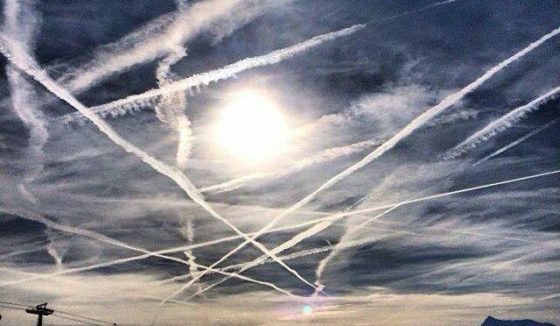 It’s undeniable our skies are being sprayed — click here and click here to see the evidence.